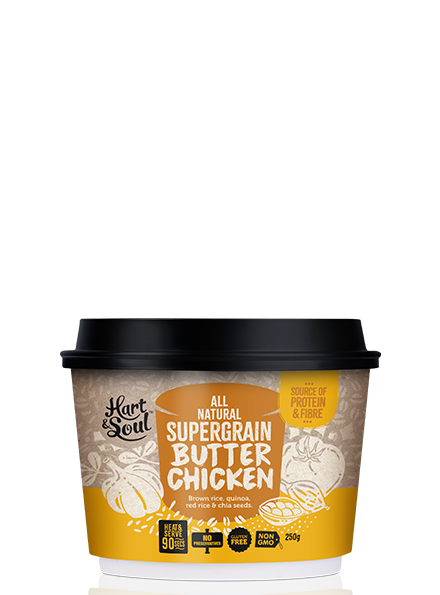 Shredded chicken in a rich creamy Indian spiced sauce on a bed of a super grains. Butter Chicken Sauce: Tomato, Chickpea, Coconut Milk, Chicken (6%), Coconut Sugar, Water, Cream (From Milk), Rice Bran Oil, Garlic, Onion, Ginger, Salt, Cashew Nuts, Spices, Butter (From Milk) (0.2%), Vinegar, Celery. Cooked Supergrain Sachet: Brown Jasmine Rice, Quinoa, Red Rice, Chia Seed, Rice Bran Oil. Contains Milk & Tree Nuts. Made in a facility that processes Crustacean. Egg, Fish, Sesame & Soy.